Metalon is frequently used in automotive applications where the laminate is applied to extruded body side mouldings, windscreen surrounds and interior decor. Metalon. 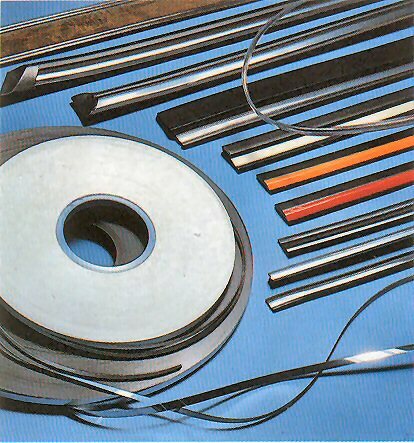 A bi-laminate of metallised polyester and PVC suitable for interior use, or exterior use when protected by a clear UV stabilised overlay applied to the moulding during the extrusion process. Metalon. A bi-laminate of UV stabilised metallised polyester and PVC suitable for exterior use, and eliminates the need for a clear UV stabilised overlay. Metalon can be converted into ‘block’ form ready for post slitting at your site, or subsequently slit to a finished specified width to suite the width of your profile. Please contact us for further information.